3D Brass letters gave golden looks for signage. Being a client-centric organization, we are engaged in offering an exclusive range of Brass 3D Letters. 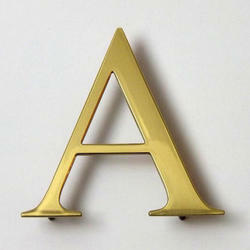 Being a quality oriented organization, we are involved in offering standard quality assortment of Brass 3D Letter. Keeping track with the market development, we are engaged in offering our clients with a wide collection of 3D Steel Letter Signboard.